Did you know that there is a multi-parish Secular Franciscan Fraternity which meets monthly in the St. Stanislaus Parish Center? 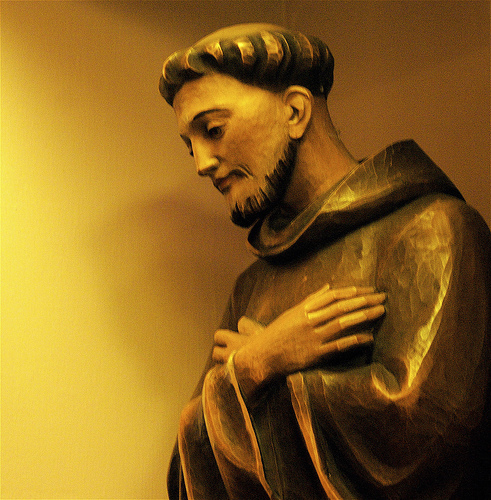 The SFO is a lay order of Franciscans dedicated to bring Gospel to Life – Life to Gospel. As such the SFO is a NGO, a non-governmental organization with a presence in the United Nations, to encourage Justice and peace, integrity and creation – all God’s creations and creatures. Everyone thinks that they know the “birdbath” saint in the garden — that Italian fellow, Francis of Assisi. You know, the one who wandered about preaching on street corners. Wore a brown habit and sang songs to the birds, didn’t he? Yep, he’s the one. Giovanni Baptista Bernadone was the oldest son of a cloth merchant whose frequent travels to France made him nickname his son Francesco, the only saint canonized under a nickname. His mother Pia was from Provence in Southern France, an area known for its light-hearted songs. As a rich young man about town, Francis became the leader of the party-crowd. He longed to be a knight doing great deeds so his father outfitted him with a horse and armor. Unfortunately, Francis gave all that to a needy knight, managed to get himself caught in a war, and was imprisoned for a year. When he got back to Assisi, he was ill for two years with a debilitating fever that robbed him of his zest for life. Today we might call it Post Traumatic Stress disorder. Then, the poor fellow heard a crucifix speak to him. Christ asked him to rebuild His church so Francis went out, got some stones, and started to repair the actual church. Of course, he “borrowed” some of his father’s fabrics to sell to get the money but it was for a good cause, wasn’t it? When his father objected, Francis renounced both his father and his father’s wealth. Poverty was his chosen way to imitate Christ. That’s the short version of his life. The long version is continuing in Christ’s church today because this simple man from Assisi has affected the world in ways that only a great saint can or could. His love of Christ led him to live a life so Christ-like that Francis was granted the dubious blessing of the stigmata – the outward representation on his body of Christ’s wounds. His love of Lady Poverty allowed him to reach out to all people, to all creatures, to all nature itself, telling the stories of God. Speaking in his own Italian rather than formal Latin, Francis told people how much God loves them and he is telling us that today. The Secular Franciscan Order (SFO) is a branch of the worldwide Franciscan Family. We are single and married. We work, worship and play in the community where we live. The SFO is a secular movement, established by St. Francis of Assisi more than 800 years ago. Our purpose is to bring the gospel to life where we live and where we work. We look for practical ways to embrace the gospel in our lives and try to help others to do likewise. In today’s world we are plagued by time schedules, projects and activities that leave us tense and stressed. The SFO becomes our place of refuge and renewal where our brothers and sisters in Francis support and inspire us. You, too, can become a life-time member of our family — if God is calling you. Secular Franciscans follow the SFO rule that requires us to spend time in community with our Franciscan brothers and sisters. Our rule mandates us to be involved in apostolic ministries and with youth. When we are called to action, we embrace the call joyfully. Some of us are religious education teachers, some have a special ministry to animals, some have made a commitment to Perpetual Adoration. Some work with the poor and lepers halfway around the world. Is the SFO for you? If you have a Franciscan vocation, you probably have a desire to do something more. Perhaps you feel a need for support in growing spirituality. Or, deep down, you sense a need to serve God in a special way. Or, for years, you have felt an affinity with St. Francis. He seems to pop up all around and you just don’t know why. Perhaps, God is calling you! Getting to know the SFO better may be a way to determine if you have a vocation. You’ll have plenty of time to get to know us before you make any commitment. The SFO requires three months of orientation and six months of inquiry. During that time, you’ll come to our monthly gatherings and have a few informal classes. Local SFO Information: Stop by a meeting and introduce yourself! Meetings take place on the 2nd Sunday of the month from 11:30 am – 4 pm (the third Sunday each May) at the St. Stanislaus Parish Center. The Living Word Fraternity in Lansdale is one of several fraternities in the St. Katharine Drexel Region of Pennsylvania and one of over 1200 in the United States. When you become a Secular Franciscan, you can visit any of our fraternities as a brother or sister in Christ and in Francis. To speak with someone about the Secular Franciscan Order and to meet the family, stop by at one of our regularly scheduled meetings. Call Cindy Louden at 267.421.6203 or email her at cllouden@verizon.net.